Music replaced in Scene 18 of My Dream Takarazuka, "That's Amore". † Announced 6/6/14 - due to injury Manazuki Kou was absent from the Takarazuka performances. 7/13/14 it was announced that she would be absent from the entire Tokyo run as well. Maeda Keijiro Toshimasu is the ultimate “kabukimono,” as he rides the magnificent horse “Matsukaze,” which is nearly mistaken as the embodiment of evil, while wielding a vermillion-patterned spear. As the eldest son of Maeda Toshihisa, the lord of the Arako castle in Owari, Keiji had once been in the position of taking over as the head of his family. But the title was handed over to Keiji's uncle, Maeda Toshiie, after Toshihisa incurred the displeasure of Oda Nobunaga, who would unify Japan by force, because Toshihisa had detested war. Conflict with Toshiie had led to Keiji setting out on an aimless journey together with Toshihisa. Keiji eventually returns to Kaga, which is ruled by Toshiie. The people know him as a kabukimono, who are masterless samurai who shock people with their flamboyant appearance and outlandish behavior. A cold wind of winter blasts through Kanazawa in Kaga. Seats for an open-air tea ceremony are laid out in the garden of Keiji's estate, even though the weather is so cold that ice forms. On the recommendation of his very close friend, Okumura Suke-emon, a ceremony is to be held with Toshiie invited to attend. Once Toshiie appears at the estate, Keiji, who is in the habit of shocking and surprising people, treats his guest with hospitality, a move that is actually part of a plan. Toshiie is shaking in anger. But with no way of dealing with the ferocious Matsukaze and Keiji, who is relentlessly pointing his spear, Toshiie returns home, running at full speed. As Keiji watches him flee, he apologizes to Suke-emon for his behavior. At the same time, he expresses firm determination: Dying while under the rule Toshiie of Kaga would be an intolerable thing, would it not? Suke-emon, who senses these thoughts, silently hands him a bag of gold. The gift is from Toshiie's wife Matsu, who has entrusted it with Suke-emon to assist Keiji. The pair, Keiji and Matsu, had spent many days of their childhood together in Arako. The nature of their relationship was clear to everyone. But on Nobunaga's orders, Matsu was to become Toshiie's wife. Even after her marriage, she still took an interest in the affairs of Keiji. Keiji, having distanced himself from the Maeda family and steeling himself for the life of a kabukimono, leaves the Kaga realm together with Matsukaze, deeply in love with the thoughts of Suke-emon and Matsu. Time passes on. Keiji eventually makes it to the capital of Kyoto. All of Japan is under the rule of Toyotomi Hideyoshi, and the land is now thought to be a peace. But in an era when someone can become a supreme ruler overnight, there are still Daimyo throughout the country who have yet to yield to Hideyoshi, like smoldering embers. Despite the mores of the era, Keiji is a lover of freedom and he lives by following his heart. Even so, such an open-minded approach will become caught up in the motives of people who want to use his success for their own secret ends. 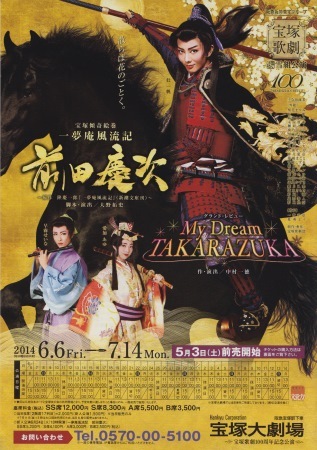 Various dreams exist in each and every person's life, as with the dreams created by the Takarazuka Revue, which marks its centenary. The dreams of travelers, young people and lovers comprise this revue. A memorial song assembled by Uzaki Ryudo and Aki Yoko will set the tone for the last stage appearance by Sou Kazuho. The final performance for Top Combi Sou Kazuho and Manaka Ayu. Also the final performance for Vice Kumichou Asaki Yumemi, Misuzu Aki, Shiranagi Suzu, Oosumi Rei, Amane Sara and Subaru Hanaka. Created by mitsuesan. Last Modification: Wednesday 09 of August, 2017 14:33:43 PDT by caithion.